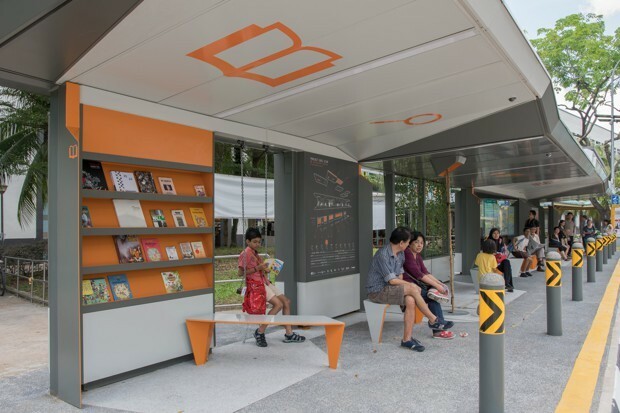 While the UK is known for its sorry bus stops, despite some creative grassroots efforts to improve them, Singapore’s bus stops are already pretty decent. But what if the humble bus stop could be a place you actually looked forward to frequenting? That’s the question the Singaporean firm DP Architects aimed to answer. “We wanted to redesign a commonplace thing we take for granted,” says Seah Chee Huang, the firm’s director. Now, thanks to DP Architects in collaboration with various agencies of the Singaporean government, there’s a bus stop in Jurong, an area in the southwest of the island, that has elements you might find in a café, park, or your living room—all places you’d probably prefer over a bus stop. The stop features ample seating, a rack of books geared for all ages, from Enid Blyton to Ray Bradbury, bicycle parking, a swing, artwork by the local illustrator Lee Xin Li, and a rooftop garden, complete with a small tree. In addition to the print books, users can scan a QR code to download e-books from the National Library, charge their phones, and peruse interactive digital boards that provide arrival times and a journey planner to find the fastest route. Screens also broadcast information on weather, news, and local events. Solar panels help offset electricity use. 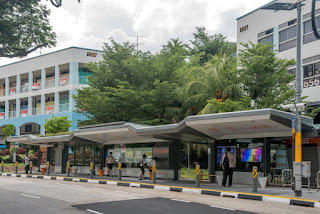 It’s no accident that the bus stop is in Jurong. The government has made this area a testing site for “smart” innovations, in line with its initiative, launched in 2014, to make Singapore a 'smart nation'. Technologies being developed include driverless vehicles, lights that dim or brighten in response to motion, and an automated system that senses when trash bins need emptying. The bus stop has been in operation for six months, and in another six the government will determine which of its features to potentially include in other stops. Much depends on the public’s feedback, says Khoong Hock Yun, the assistant chief executive officer of the government’s Infocomm Media Development Authority, which has a hand in the project. Khoong says that so far, it’s clear that one of the most popular elements is the phone charging station. “Cell phone batteries are never updated fast enough for us,” he laughs. “People always need chargers.” Passengers are also making good use of the interactive boards, he says. Seah of DP Architects hopes his firm will have the opportunity to design more stops. “We want to make waiting for Singapore’s buses a joyful and enriching experience,” he says. All images courtesy of Infocomm Media Development Authority.